COLFAX — Prioritizing disaster resilience and response in his first full day as California’s 40th Governor, Governor Gavin Newsom today met with emergency responders at the State Operations Center and toured a high-risk fire area. “It’s not a coincidence that my first full day as Governor is focused on emergency preparedness. 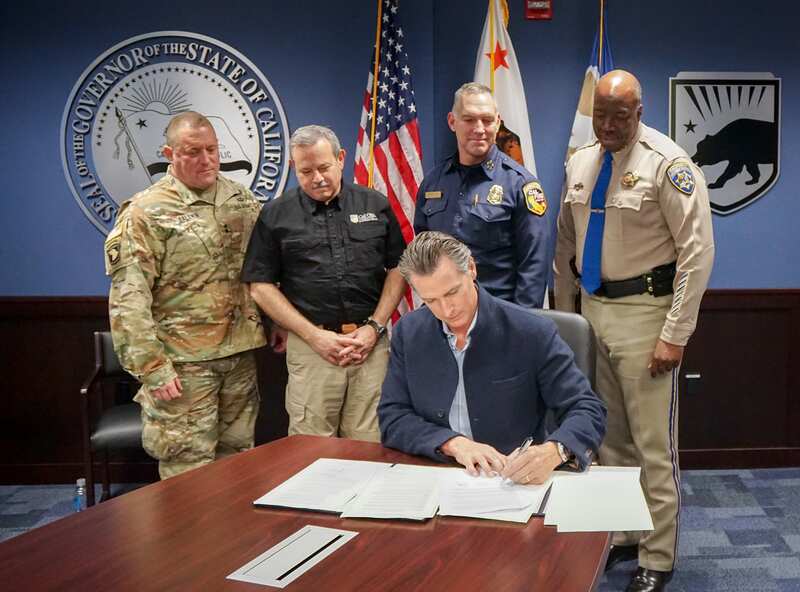 It’s deliberate, it reflects intentionality, and it speaks to the priority that I place on emergency preparedness, response and recovery,” said Governor Newsom. While standing beside his emergency management and response team, Governor Newsom announced a series of actions aimed at protecting Californians from the growing threat of wildfires and other natural disasters. Spurred by recent fires where many elderly, low-income and socially-isolated individuals found themselves without the means to escape, Newsom signed an executive order that directs state agencies to consider risk management through an added socioeconomic lens. It asks agencies to identify geographic areas with populations that are particularly at risk during natural disasters. Paired with traditional natural risk factors, this data paints a more accurate assessment of the real human risk and can help guide preventative action to help prevent loss of life — especially for vulnerable groups. The second executive order modernizes the way the state contracts for technology systems, and the order’s first application will be fire detection. Instead of government prescribing specific technology solutions — something government doesn’t always do well — this Innovation Procurement Sprint allows an agency to specify to the private sector what problems it is trying to solve. And it allows agencies to convene outside experts to source innovative solutions and systems. In fire detection technology, this new process comes with the goal of having cutting-edge technology in the hands of emergency responders by next fire season. At the event, Governor Newsom also announced that he has joined with Governors Kate Brown of Oregon and Jay Inslee of Washington in requesting President Donald Trump double the federal government’s financial investment in managing federal forestlands in California, Washington, and Oregon. The Governor will invest in a five-year, $1 billion forest management plan in his next budget and the state has already invested $111.3 million in forest health since 2017. But the U.S. Forest Service has seen its budget cut by more than $2 billion since 2016, reducing the agency’s capacity to manage federal forestland in California. This letter emphasized that the western states’ significant state-level efforts will not be as effective without a substantial increase to wildland management by our federal partners. 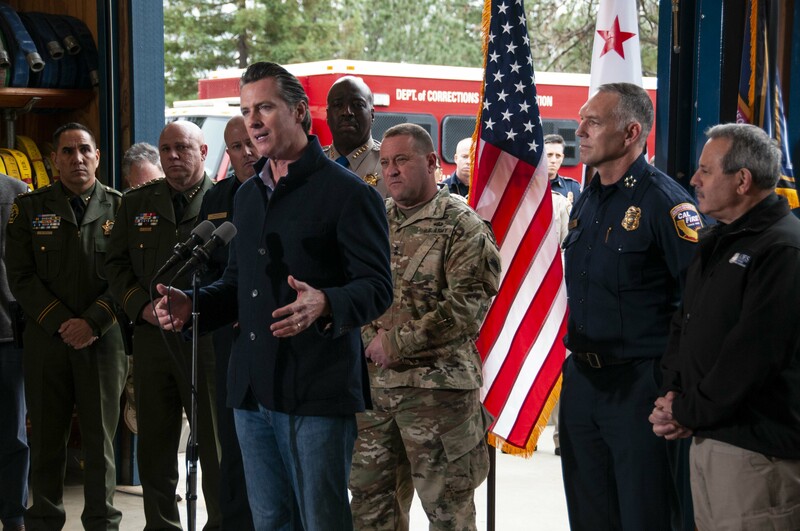 Governor Newsom today also announced the Administration’s leadership team on emergency and natural disaster preparedness, response and recovery. His Administration will establish a Senior Advisor on Emergency Preparedness and Management within the Governor’s Office to directly coordinate with Administration officials across agencies and departments, as well as federal, state and local officials and public safety experts. The position will be filled by respected Capitol staffer Rhys D.J. Williams, who previously served as Chief of Staff in the Office of the Lieutenant Governor. With an emphasis on continuity and expertise, Governor Newsom will also retain and reappoint Governor’s Office of Emergency Services (Cal OES) Director Mark Ghilarducci, California Military Department (CMD) Adjutant General David Baldwin, and California Highway Patrol (CHP) Commissioner Warren Stanley in their current positions. Newsom will also appoint as Director of the California Department of Forestry and Fire Protection (CAL FIRE) Thomas Porter, currently serving as Acting Director. Williams will serve as Senior Advisor for Emergency Preparedness and Management within the Governor’s Office. Williams has served in senior leadership positions for two California Senate Presidents (Steinberg and Perata) since immigrating to the United States in 2009. Most recently, Williams was the Chief of Staff to Lieutenant Governor Newsom. Ghilarducci was appointed the Director of Cal OES in July 2013 by Governor Edmund G. Brown Jr., having previously served as Secretary of the California Emergency Management Agency under Governor Brown. He has also served as Deputy Director of Cal OES under Governor Gray Davis, where he oversaw statewide emergency operations, planning and training. Porter is currently serving as Acting Director at CAL FIRE, where he will continue to serve as the appointed Director. Porter began his career with CAL FIRE in 1999 and has held multiple responsibilities, including vegetation management, pre-fire programs, and fuel management grant programs. Porter was promoted to Southern Region Chief in 2015, and later to Chief of Strategic Planning. Stanley, appointed by Governor Brown in February 2018, will continue his service as the leader of the largest state law enforcement agency in the nation. Stanley is the first African-American to hold the rank of Commissioner in the history of the CHP. Stanley has served the people of California within the CHP since 1982 — and has held every available rank from Officer to Commissioner. Baldwin was appointed the Adjutant General of California in April 2011, where he is responsible for the operation of the State Military Department. General Baldwin enlisted in the California Army National Guard in 1982 and his military assignments have included Rifle Platoon Leader, Operations Officer, and Executive Officer. He has held command posts on deployments to the Middle East and Afghanistan. Photo credit: Governor’s Office of Emergency Services. For high-resolution copies of these photos, contact Danella.Debel@gov.ca.gov.